GIVEAWAY: Cowgirl Chocolates GIVEAWAY & Review! So Yummy! When I first heard that Cowgirl Chocolates created spicy chocolate treats, I knew I had to try it out! I am a lover of anything with a fiery kick to it. These chocolates met two of my obsessions--spicy food & chocolate! These little buggers did not disappoint. They arrived at my house in a couple short days. I could not wait to assemble the tasting panel so we could do the much anticipated sampling event! 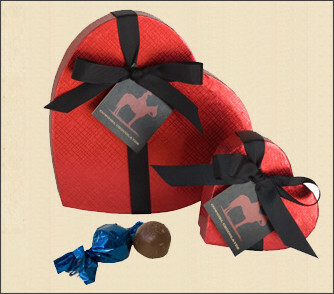 Inside the small red box (wrapped in black ribbon & a cute charm and tag) were foil wrapped treats in assorted colors. The inside brochure helped us navigate the flavors, which included awesomely unique flavors such as Habanero Caramel, Spicy Hazelnut Milk Chocolate, Spicy Cappuccino, Spicy Double Dark Chocolate and non-spicy flavors including Ivory Orange, Raspberry Lemonade Dark Chocolate, Pure Milk Chocolate, and Double Dark Chocolate. We were in heaven! They were each so delicious. I fell in love with the Spicy Raspberry Dark Chocolate truffles! At first bite it does not appear to be hot, but then the heat strikes the back of your throat--it's not an unbearable heat--it's just the perfect amount of warmth! The chocolate itself is so smooth and velvety. For the mild varieties, what they lack in unique heat, they make up for in melt-in-your mouth flavor! My favorite non-spicy treat was the Ivory Orange. The flavor was authentic and delicious, YUM. With Valentine's Day right around the corner, this would be the perfect time to casually mention this awesome company to your significant other! Or the perfect time to order a special treat for someone you love! Head on over here and have a look around. Caution: It will make you salivate! And yell out "yeehaw!" 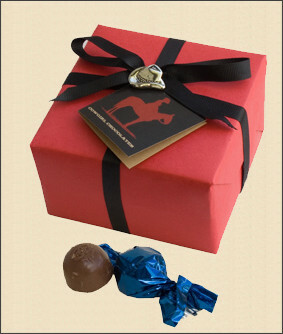 One incredibly lucky winner will win this very same box of truffles from Cowgirl Chocolates! For extra entries be sure to . . .
Make sure to enter this GIVEAWAY too! The Fine Details: This giveaway will end on Thursday, February 3, 2011 . Winner will be notified by email and has 48 hours to respond or another winner will be chosen. The winner will be chosen by random via random.org. A big thanks goes to Marilyn (the head cowgirl) at Cowgirl Chocolates for being nice enough to send me these sweet treats to complete this review & GIVEAWAY! I follow via GFC - thanks for the chance to win. I follow you on twitter (jg4462)!